Last week, the big Bruin story was the stunning debut of True Freshman QB Josh Rosen, who, in his very first game as a collegian, won National Player of the Week honors, and had people knee-jerking to premature Heisman talk. But yesterday, in Week 2 against UNLV, in his first-ever ROAD game, Rosen came back down to Earth. He had as many incompletions (7) in the first quarter as he did all game in Week 1, and later in the game he threw his first Interception, as he was hit hard before releasing the pass. Rosen kept his poise, and was still accurate on short passes and slant patterns, but was routinely overthrowing his deep targets. Some of those can be blamed on Receivers who sort of quit on their routes, and more often, had their route-progress impeded by tight, physical coverage, as the referees were letting a lot of contact go. But there were still several where Rosen just didn’t have the same touch as he did against Virginia. Perhaps the overthrows can be blamed on the thin dry Vegas air, as the temperature was measured at 96 degrees at kickoff. Regardless of the reason, the Offense suffered, because the air-connections were just not being made consistently. But the Bruins have another lethal weapon, and he goes by the name of Paul Perkins. The reigning Pac-12 Rushing Champion took the reins of the UCLA Offense, and gave them the edge they needed to blow out the Runnin’ Rebels. 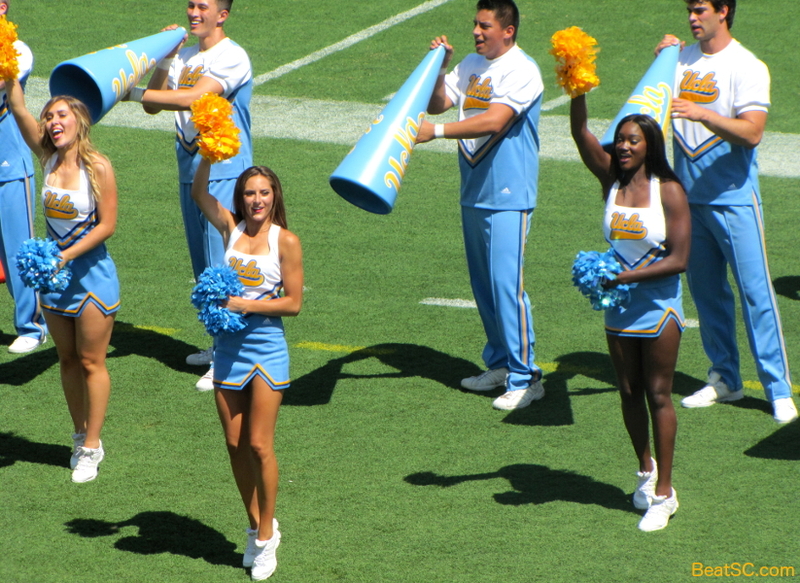 The Bruins started fast with a quick Touchdown drive on their initial possession, which culminated in a 29-yard TD slant pass to Jordan Payton. But the next scoring drive stalled and the Bruins settled for a Field Goal making it 10-0. The Bruin Defense, even without Eddie Vanderdoes, was solid and stifling, causing three straight 3-and-outs to start the game, and after that, still never let the Rebels get into the end zone. 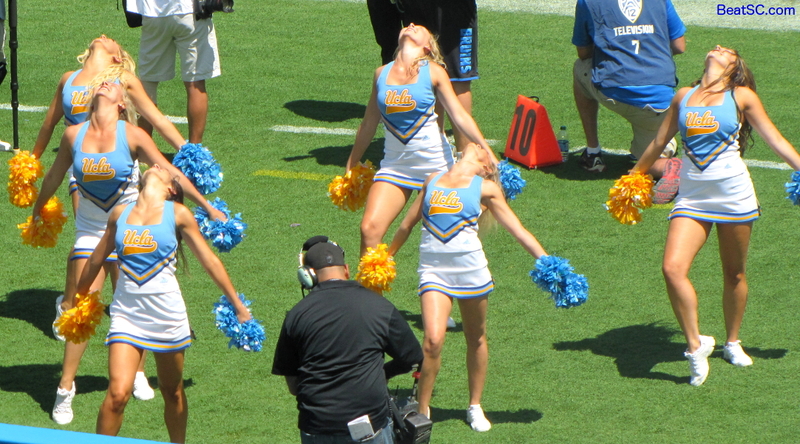 But the Bruin Offense was sputtering, so it stayed 10-0 for a long time. UNLV’s Quarterback got injured, and the back-up was not able to do anything through the air, as the Bruin Defense pressured him, and blanketed his receivers. 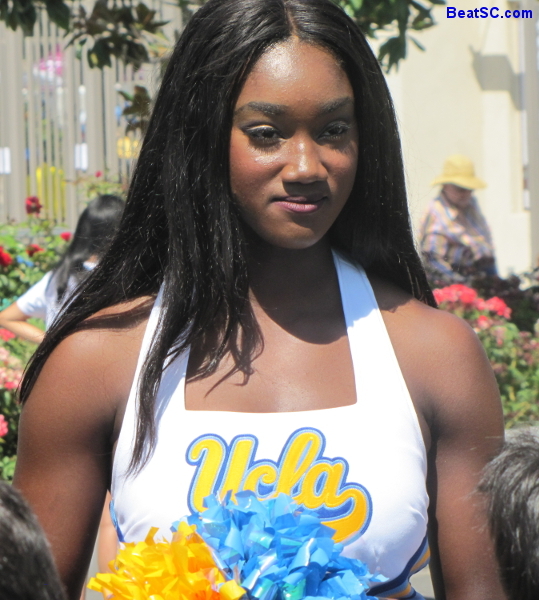 But UNLV was still down only 10-0 before Halftime, until Bruin Defensive Lineman Takkarest McKinley put pressure on the UNLV QB, forcing a wild desperation throw, which was Intercepted by Linebacker Kenny Young and returned for a Touchdown. To start the 3rd Quarter, the Bruins rode Perkins, who scored on a 7-yard run to make it 24-0, and then later in the quarter, Perkins scampered 56 yards for another TD, making it 31-0. 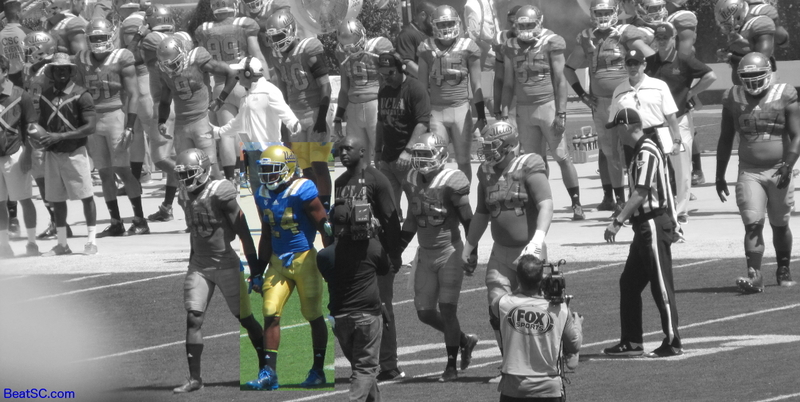 After that, a lot of second-stringers started playing for UCLA, so the first string Defense pitched a shutout. 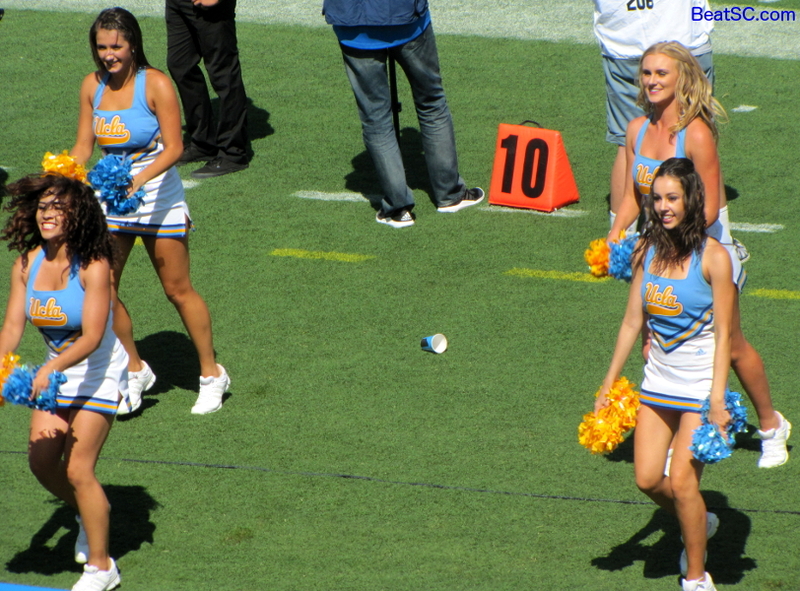 The Bruins almost got an ACTUAL shutout, but in mop-up work, Jerry Neuheisel threw 2 Interceptions, allowing UNLV to eke out a Field Goal, which they kicked solely to avoid getting blanked. The Bruins wore down the Rebels, and were running all over them as the game went on. Not only Perkins was impressive in the Ground Game — Other contributed as well. Early it was Nate Starks, who made his season debut a good one, with 35 tough yards on only 6 carries. Later, it was Freshman Bolu Olorunfunmi who ran like a stud, gaining 65 yards in 9 carries. It is comforting to know that even if Rosen isn’t the World-beater that he appeared to be against Virginia, the Bruins’ stellar Offensive Line and fine stable of Running Backs can carry the team on any given day. On Bruin Zone recently, some misguided soul said that Jim Mora would have to improve to be compared to Pete Carroll. I replied that Mora would have to have his INTEGRITY surgically removed in order to “match” Pete Carroll. He asked for details, and I listed nine items of proof, including Carroll’s habit of running up the score. Some more misguided souls may think that Mora was running up the score against UNLV, but this is NOT the case. Mora went to reserves at the start of the 4th quarter, and had Neuheisel in for the last few drives. But Neuheisel was struggling, so instead of just playing with a slow pace and simply running the ball, Mora knew that Neuheisel needed more experience running the real, high-paced Offense, and throwing passes. Running up the score is usually more associated with scores in the 60’s and 70’s, while the Bruins were only in the 30’s. A late score would not have made the final score embarrassing for the Rebels. The reason why this is an issue at all, is that the Bruins did not take a knee in the final minute. Instead, they were still running their Offense, and with 38 seconds left, a back-up Offensive Lineman got injured and had to be carted off the field with an air-cast on his leg. People will blame Mora, but I don’t. Mora sees the big picture, and the team, especially Neuheisel, needed the work. It’s unfortunate what happened, but it’s just one of these things that happens. Hopefully, the injury won’t turn out to be as bad as it looked. 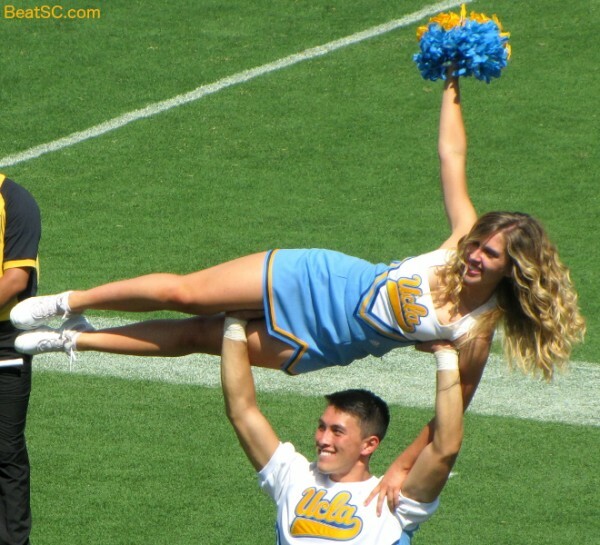 If your spirits need lifting after that somber discussion, here are 54 more new UCLA Cheerleader photos that I took last weekend at the Rose Bowl. 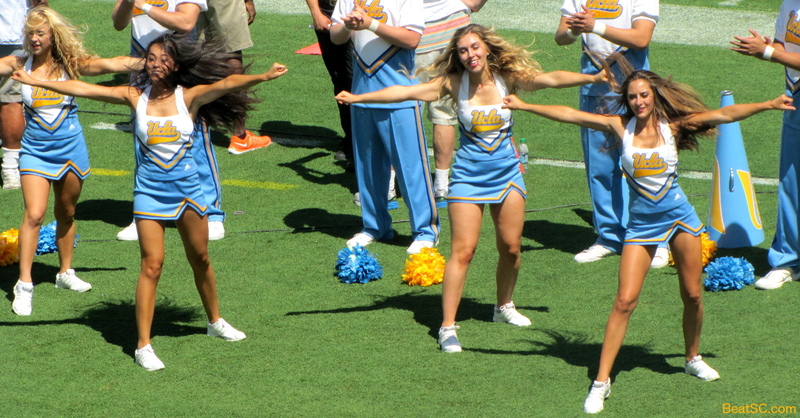 "WE CAN PERK IT OUT" was published on September 13th, 2015 and is listed in Blue & Gold News, UCLA/usc/Cheerleader Photos, UCLA/usc/Sports Photos. It bears mentioning that your final comments were necessitated by the final insult to injury delivered by CBSSports’ clueless play-by-play man, to top off an utterly disgraceful performance by the fledgling sports network. Not only did they miss the start of the game, but the Bruins’ entire first touchdown drive, to show the end of a 24 pt.blowout (that still had EIGHT minutes to go at kickoff time). Then, after further technical difficulties caused even more missed plays, the pinhead p-b-p guy practically BLAMED Mora for an injury that not only could have happened at any time in any game, but was the result of a sound if not noble desire to get the reserves more much needed actual live-game playing time. Does no one at that network understand the sport? 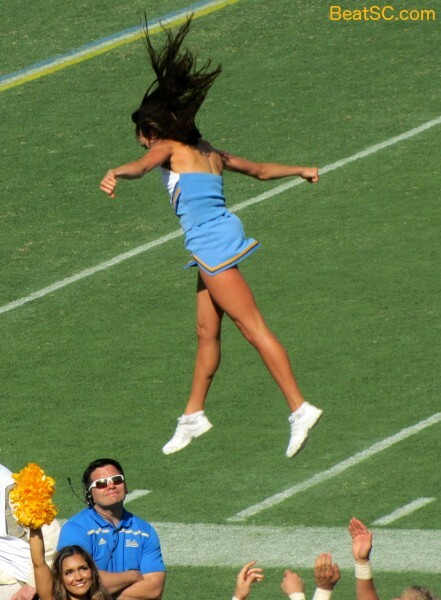 As for the bloom being off the Rosen, we’ll see how he bounces back against BYU. But the passing game was poorly executed by his receivers as well, and that’s on Mazzone. Hopefully they’ll have worked out the kinks by next week, because this game told us nothing about the Bruins’ ability to beat a good team, and it will take an entirely different level of effort and execution to beat our remaining opponents.